Again, the Gartner reveals a study showing quarterly trends in the mobile phone market. It has again experienced a general decline in handset sales during the last three months. However, smartphones still booming: this sector has experienced an increase of 46.9% compared to the figures obtained in previous years. Furthermore, the study shows that Samsung and Apple still control nearly half of the smartphone market hogging 46.5% of sales. Nokia has fallen from occupying distant third in the previous quarter, to No. 7. Now RIM is the company that takes the bronze medal, but closely followed by competitors such as HTC. How could it be otherwise, and because of the wide variety of devices with Android, Google's operating system dominates 72.4% of the smartphone market. 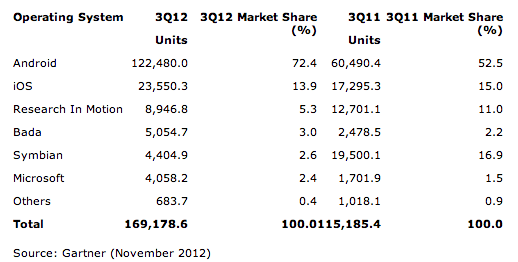 Apple followed with 13.9% and RIM with 5.3%. Article Samsung and Apple still control nearly half of the smartphone market has been originally published in News iPhone .